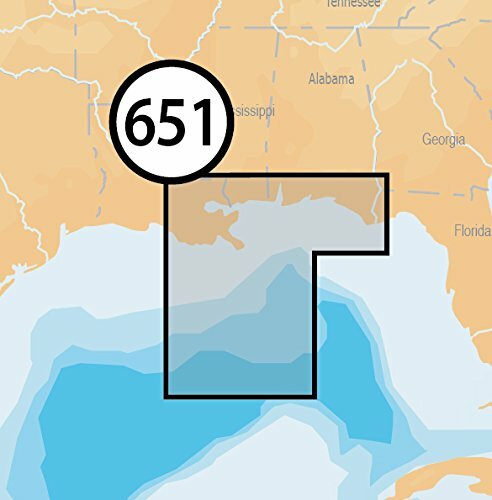 Navionics Platinum+ 651 XL Central gulf of Mexico on SD card, manufacturer's part number MSD/651P+, coverage area includes Cape San blas to baton rouge. Navionics award-winning Platinum+ charts, the most advanced multi-dimensional marine charts available, offer navigators a selection of bonus information beyond the best available navigation charts such as panoramic pictures, 3D/2D views w/satellite imagery, complete Coast Pilot guide, poi, high-definition fishing detail, and more. Navionics has amassed the most comprehensive mapping database of its kind with more than 25,000 charts and port plans. Platinum+ Plug-and-play cartography is an indispensable component of the industry's leading chartplotter manufacturers including hummiNBird, lowrance, North Star, raymarine and simrad. Visit navionics for complete compatibility and coverage information. Features: paper chart appearance for the clearest charts and best detail full seamless presentation with IC (intelligent clarity) technology user-selectable safety depth contours navaids with explain navaid Description feature port services with telephone Numbers (where available) including fuel, transient berths, repairs, and more tides & currents high-resolution satellite photo overlay 3-dimensional view panoramic port pictures Coastal points-of-interest high-definition fishing detail for us waters.